Fewer machines are better poised to enslave humanity than the ubiquitous iPhone. That doesn't make Apple's gadget the ideal device for a Terminator game, though it does suggest a good platform for crude movie tie-ins. Terminator Salvation for the iPhone is another video game spin-off of the fourth Terminator movie, released earlier this month as another option for those look for an interactive expansion of the McG-directed Christian Bale-starring action flick. You could go with the console version of the game blasted through in three hours by Kotaku's Brian Crecente or this game, also a third-person shooter, which I wrapped up in 90 minutes. Both tell side-stories to the movie, this one alternating player control from John Connor to Marcus Wright, the heroes of the film. 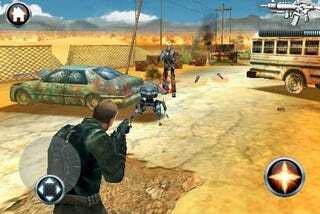 The iPhone edition, developed by Gameloft and credited by the company as its 12th movie game, is comprised of eight levels of mostly on-foot cover combat with a couple of vehicle-based shooting missions thrown in. Several tilt-the-iPhone circuit-board hacking segments are sprinkled in as well. There was effort applied here, a reason enough for gamers to hope and part with five bucks? The Movie Game Solution? Consider the variations of the simplistic, licensed movie game that gets gifted to movie fans. In the old days, there were lots of side-scrolling beat-em-ups on, say, the Genesis. These games were full price, but barely resembled the movies they were based on. They've mainly had some successors, including cheaper but still crude cell-phone movie games and expensive but much more graphically and aurally cinematic movie games for higher-end consoles. That latter group includes the recent console version of Terminator Salvation and typically costs consumers more than their gameplay quality warrants. Their value is in the you-are-in-the-movie virtual-acting experience they provide. You are John Connor up against Terminators while the signature soundtrack clangs. The fourth way? An iPhone/iPod-Touch game like this one that can look good enough and sound epic enough to put you in a movie experience, but will only run you five dollars. In terms of balancing blockbuster-cinematic-appeal, game-design-quality and wallet-expense, this may be the perfect scenario to amuse players without burning them. Apple's platform to the rescue? Clumsy: While our future fight against murderous machines will not be an easy one, let's hope it's not this awkward. Gameloft's approach with third-person games like this on the iPod/iPhone is to imitate dual-analog controls via a virtual thumbstick on the left and a drag-your-right-thumb-to-aim mechanic on the right. The firing button is in the screen's lower right corner. The scheme works fine in straight-on firefights, and the snap-cover system works fine also when approached in a straight line, but at angles or in the heat of battle there is much stumbling, much getting caught on scenery and a very slow turning radius. Humanity can't win this way. That Other Marcus: One assumes the game's designers have played Gears of War. Hence the cover system. Hence the curb-stomps. Hence the button-mash melee moments. Hence the vehicle missions. Where's Dom's wife? The problem here is that Gears controlled well. This barely gets by. What you've got in Terminator Salvation is what one's lowest expectation of movie games should get you: something basic but enriched by the style of the movie. There's little the designers can probably do with the thin source material — after all, what is the essence of Terminator fiction that can be ported to a video game in any more complex way than skinning the enemies to look like killer robots? Little opportunity was squandered, because it's hard to see what opportunity there was. Movie critics have already declared that the Terminator Salvation movie is like a video game. Doubtless they didn't have a game like Ico, Tetris or Portal in mind when they made that comparison, but might they have been comparing it to a game like iPhone Terminator Salvation? They might as well have been. Terminator Salvation was developed by Gameloft for the iPhone and iPod Touch. Retails for $4.99 USD. Played through easy mode in 86 minutes, found 71 item drops to unlock concept art, started Extreme difficulty which swaps the lead character for a Terminator.